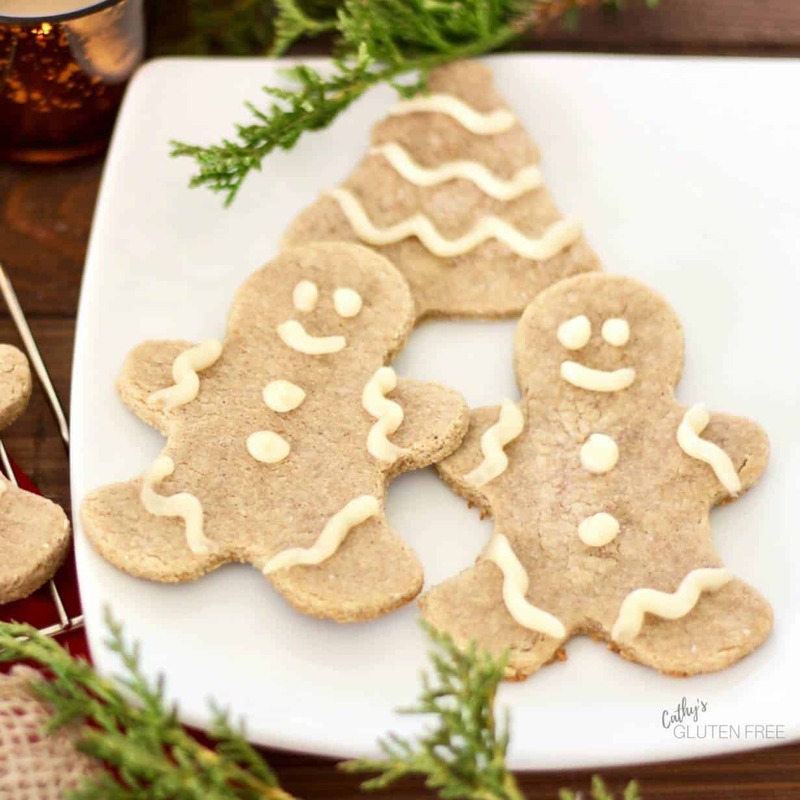 These gluten free gingerbread cookies are a little soft, spicy, and great for cutting into shapes. 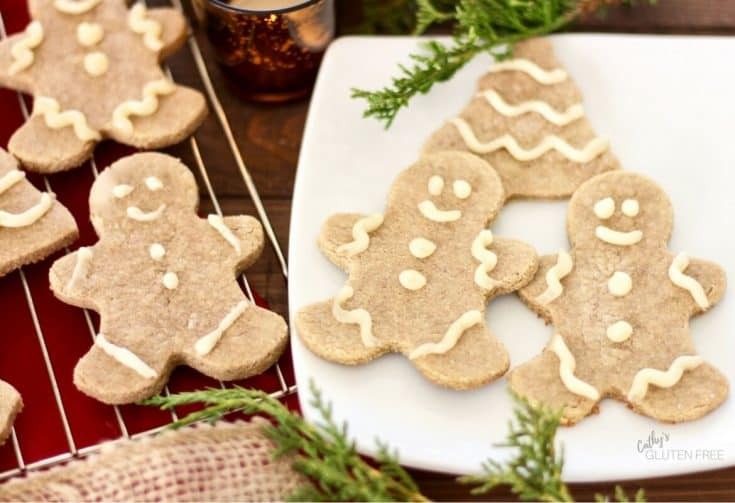 When you adopted a healthy, gluten free diet, did you fear that you’d never have a good gingerbread cookie again? Well, no worries! This allergy-friendly recipe is actually free of all grains, dairy, corn, soy, and nightshades. It’s sweetened naturally with just a little honey, and the base of almond and coconut flours makes it delicious! You might also like Gluten Free Lavender Biscotti, Crusty Artisanal Bread, or Pumpkin Spice Muffins. 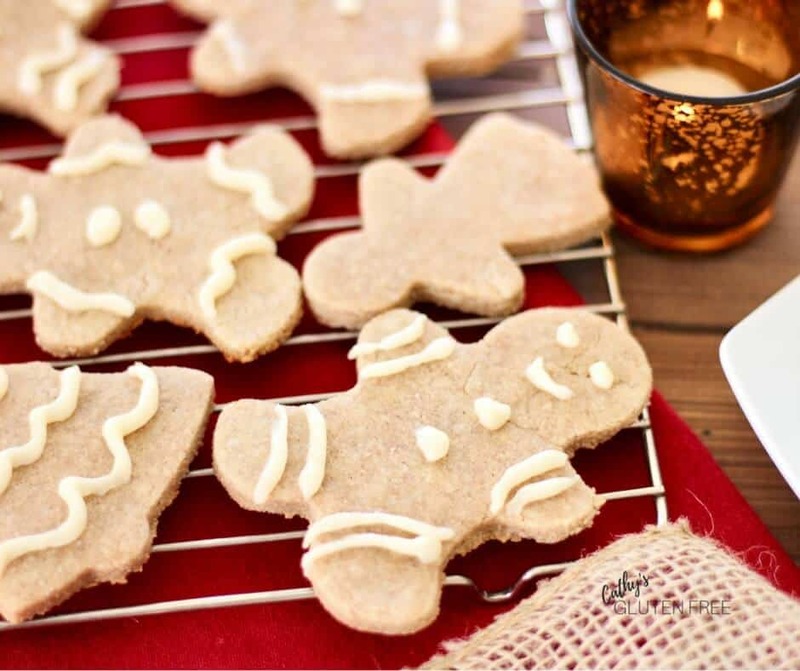 To maintain the low-sugar content of the cookies, I decorated them with a blend of two parts coconut butter to one part honey. Cream the icing thoroughly so you don’t have any lumps in it. If you don’t have piping bags and decorating tips, just use a simple plastic sandwich bag. Cut a tiny hole in the bottom corner, insert your icing, and draw away! Your cookies will go together easily if you plan ahead a little and set out your flours and eggs to come to room temperature. (Nut flours should be stored in the refrigerator to avoid rancidity.) Coconut oil that is neither hard nor runny will work best here, as you’ll see in the video below. If yours doesn’t happen to be at just the right temperature – how often does that happen? – melt it. Then refrigerate it, stirring occasionally until it it starts to firm up and is just right. After mixing your dough, your cookies will be easiest to roll out if you’ve chilled your batter in the refrigerator for an hour or so. You’ll notice that I used a white flour to keep my dough from sticking as I rolled it. That was arrowroot flour. Tapioca flour would work just as well. 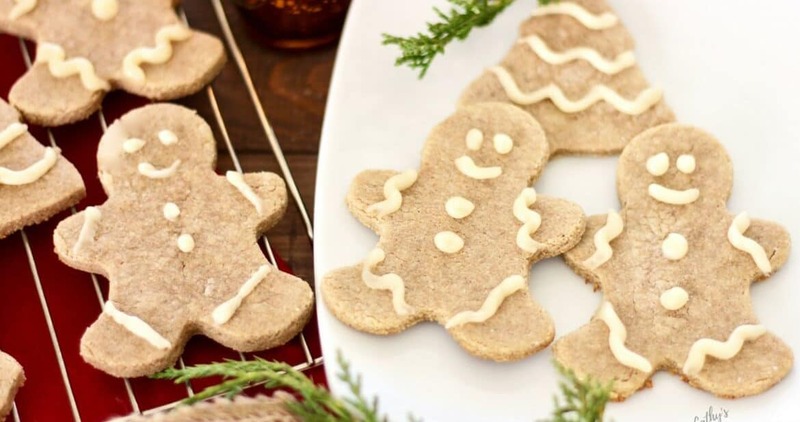 None of these tips is essential, but they will make your cookie baking easier. In a medium mixing bowl, add coconut oil, honey, vanilla, and eggs, whisking after each addition. Stir the wet ingredients into the dry and combine until dough forms a ball. Chill for 1 hour in refrigerator for easier rolling. Roll out dough on a gluten-free-floured surface with floured rolling pin or between two layers of parchment paper. Cut into shapes with cookie cutters. Lift onto parchment-lined baking sheets. Bake for about 5 minutes until cookies are just starting to brown around the edges. Cool on a wire rack. Stir coconut butter and honey together until very smooth. Cut a very small corner off a plastic sandwich bag. Transfer icing to the sandwich bag and squeeze through the hole in the corner to decorate cooled cookies. Thank you, Terri! I must check out your gluten-free board. Wonderful! I’m sure you’ll enjoy them. I’ve made similar cookies before so I know these are gonna be good! 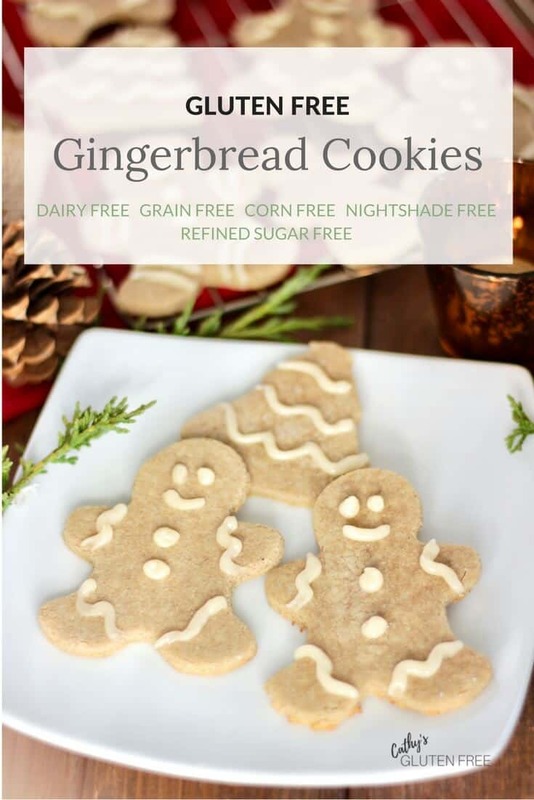 Love this, especially with almond flour. My mouth is watering. I love the honey in the icing too, so flavourful and better-for-you! Thanks, Gabrielle! Doesn’t almond flour make great baking! 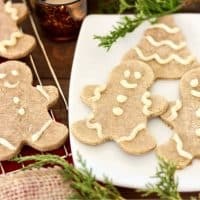 Coconut butter honey icing is my go-to for gingerbread as well! It looks so pretty. 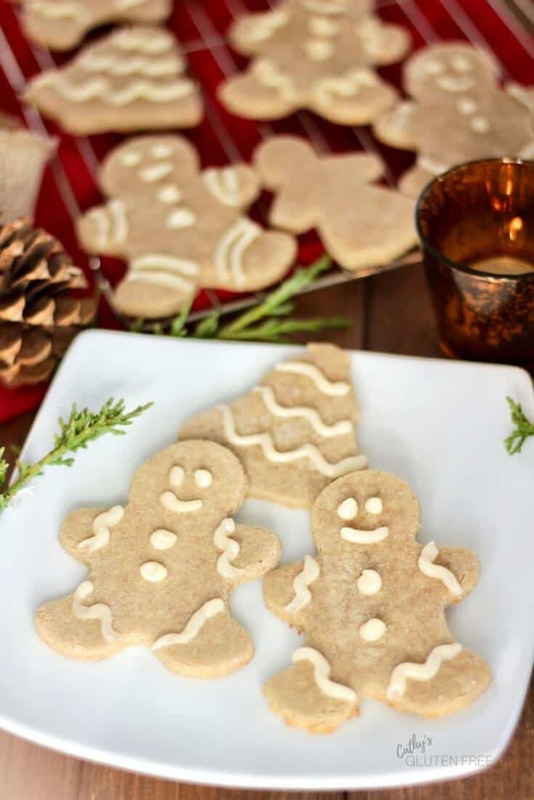 Beautiful cookies – the almond flour must make them so tender. Isn’t that interesting! I just looked in my cupboard for non-refined-sugar ingredients that I might use to decorate the cookies, and I saw a jar of coconut butter there. I was quite pleased with how easy and good the coconut butter and honey combination is. Of course, I shouldn’t be surprised that I’m not the first!